BT4811 – 4” Embroidery scissors are all stainless steel with sharp points allowing precise cutting. BT4817 – Compact embroidery scissors sized for controlled and precise cutting of detailed work. 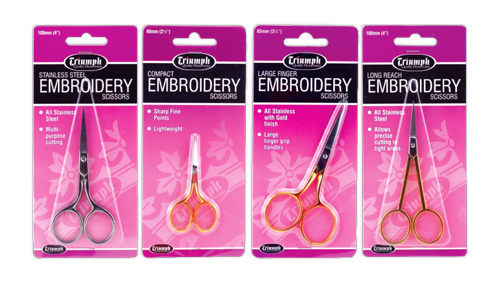 BT4818 – 3½” embroidery scissors have contoured handles allows extra comfort for larger fingers. 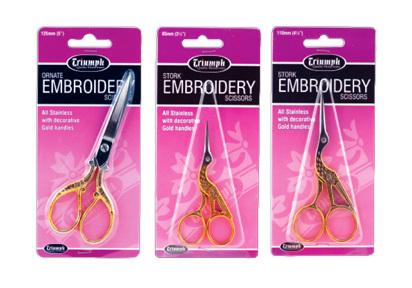 BT4819 – 4” Long Reach embroidery scissors have extended handles to allow snipping in tight areas e.g. Machine embroidery. All Stainless with decorative Gold handles. Fine points allow precise cutting. Convenient size when quick cutting is required. 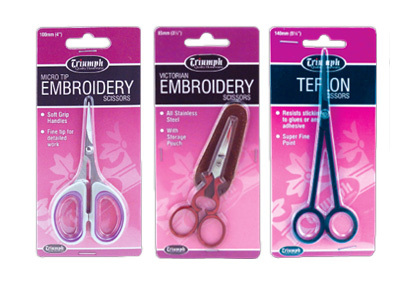 BT4810 – 4” Embroidery scissors have soft grip handles with larger finger grip. BT4816 – Victorian Embroidery Scissors are handy for snipping threads and detailed work. BT4820 – Teflon Scissors features blades resistant to sticking to adhesive tape or glues.